Tweet of the day … Why don’t we dunk him and see if he floats? 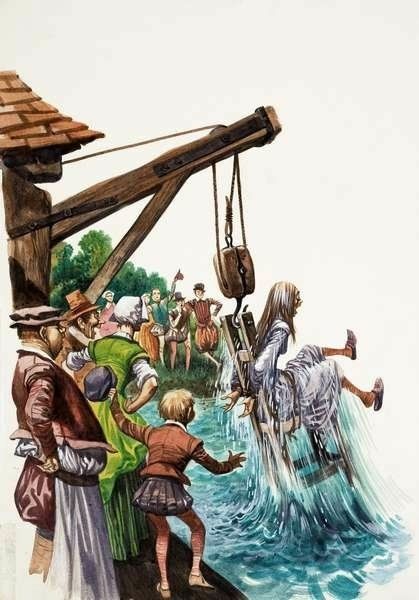 If she floats, she’s a witch. If she drowns, she’s innocent. This entry was posted in Government, Humor, Politics, Uncategorized. Bookmark the permalink. 5 Responses to Tweet of the day … Why don’t we dunk him and see if he floats? Don’t let them kid you Aus. The Left has fallen apart. Always, always they could count on the Right to for. Then along came Trup and turned their world on its head. But horrible as that was for them they could still count on the Rhinos to fold. Throw an accusation of sexual assault on a republican and the party will publicly crucify him regardless of the lack of merits of the accusation. We have entered a new era in American politics. The democrats have overreached, overplayed, over-lied, over insulted, over everything evil-ed everything and everyone in their path and their chickens are coming home to roost. People have been brainwashed by TV series’ episodes which show polygraphs as infallible. As Scott Adams reminded us recently, there is no such thing as a lie detector machine. If a person can be trained to beat a polygraph like Ford trained her girlfriend, they are definitely fallible. Ford, herself, is evidence that it can assist a liar who then can claim she passed. More than two dozen women who personally know D.C. Circuit Judge Brett Kavanaugh from different times in his life gathered Thursday at the Capitol to share why they are standing by Kavanaugh amid allegations of sexual misconduct by Christine Blasey Ford and others. There were always only a few undecided Senators re Kavanaugh. If those undecideds vote “NO,” they will have normalized behavior that will destroy our Republic and prevent Americans from ever reaching across the aisle. 1) weaponizing false claims of sexual assault; 2) destroying background investigation process by withholding information from both FBI AND colleagues; 3) ruining the reputation of men (and later women) for political purposes; 4) the release of home address etc. for Congress; 5) protestors confronting and mobbing members of Congress at home, work, restaurants; 6) leaving of threatening messages to Congress & staff; 7) encourage anonymous complaints to FBI. When Republicans warned Dems not to get rid of judicial filibuster, they ignore warning. If Kavanaugh is not confirmed, this will not end well for anyone. END.